Triangle UXPA - [UX Book Club] Raleigh Book Discussion of "Microinteractions: Designing with Details"
[UX Book Club] Raleigh Book Discussion of "Microinteractions: Designing with Details"
October's bookclub will be at Centerline Digital in Raleigh once again, and we'll be discussing Dan Saffer's "Microinteractions: Designing with Details." 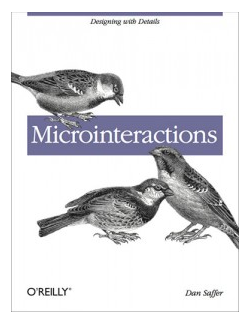 The differe nce between a good product and a great one are its details: the microinteractions that make up the small moments inside and around features. How do you turn mute on? How do you know you have a new email message? How can you change a setting? All these little momentsundefinedwhich are typically not on any feature list and often ignoredundefinedcan change a product from one that is tolerated to one that’s beloved.